Description: Small property houses provide living space to about eight million migrant workers, office space for start-ups, grassroots police stations and public schools; their contribution to the economic growth and urbanization of a city is immense. The interaction between the small property sector and the formal legal order has a long history and small property has become an established engine of social and legal change. Chinese Small Property presents vivid stories about how institutional entrepreneurs worked together to create an impersonal market outside of the formal legal system to support millions of transactions. Qiao uses an eleven-month fieldwork project in Shenzhen - China's first special economic zone that has grown to a mega city with over fifteen million people - to demonstrate this. 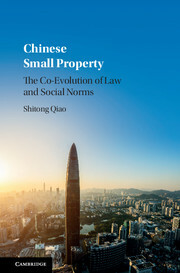 A thorough and detailed investigation into small property rights in China, Chinese Small Property is an invaluable source of new information for students and scholars of the field.